MANIC PANIC, the iconic hair color and cosmetics brand founded by punk rock sisters Tish and Snooky, is celebrating their fortieth year of cutting-edge beauty throughout 2017. To kick off the celebration, the brand introduces Amethyst Ashes, a limited-edition Manniversary Classic hair color, named by fans, to add to their extensive and vibrant collection. MANIC PANIC invited their ‘dyehard’ fans to partake in naming their limited-edition hair color – a slate gray with a delicate touch of violet. Fans shared their creative ideas through a submission form on the MANIC PANIC website, with one name ultimately winning out over the others. In just days, thousands of entries were submitted, and the final name Amethyst Ashes, was chosen after being submitted by two participants. To showcase the New York City-born company, the limited-edition jar, designed by artist John Holmstrom, features illustrations of the original MANIC PANIC boutique on St. Mark’s Place next to an endearing caricature of founders Tish and Snooky. “We received thousands and thousands of amazing submissions! We were so thrilled to see all of our fans partake in naming this beautiful shade,” says Tish. Like other classic MANIC PANIC hair dye, Amethyst Ashes is semi-permanent and 100% vegan. 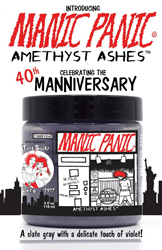 MANIC PANIC’s Manniversary edition of Amethyst Ashes will be available for purchase in July 2017 for a limited time only. Tish & Snooky’s® MANIC PANIC® NYC began on 7/7/77, when two N.Y.C.-born sisters, Tish and Snooky, added some extra ambition to their rock ‘n’ roll lifestyle. At the time, the sisters were singers in the original Blondie lineup. Few of the people who helped to ignite the late 70’s PUNK scene would have ever dreamt of the company's current acceptance by the mainstream. For more information, please visit http://www.manicpanic.com and http://www.manicpanicprofessional.com.